Only Chicago and New York City posted annual home value depreciation. On average, homes lost -1.3% and -1.2% in value, respectively. It should be noted, however, that the Case-Shiller Index is an imperfect gauge of home values First, as mentioned, the index tracks changes in the detached, single-family housing market only. It specifically ignores sales of condominiums, co-ops and multi-unit homes. Second, the Case-Shiller Index data set is limited to just 20 U.S. cities. There are more than 3,000 cities nationwide, which illustrates that the Case-Shiller sample set is limited. And, lastly, the home sale price data used for the Case-Shiller Index is nearly two months behind its release date, rendering its conclusions somewhat out-of-date. That said, the Case-Shiller Index joins the bevy of home value trackers pointing to home price growth over the last year. The Federal Housing Finance Agency (FHFA), for example, reported similar home price growth with its October 2012 House Price Index (HPI). 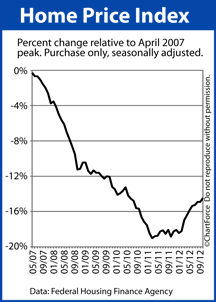 Home values rose 0.5 percent between September and October 2012 nationwide, the FHFA said, and climbed 5.6 percent during the 12 months ending October 2012. Economists attribute increasing home prices to higher buyer demand, record-low mortgage rates and the gradual improvement of the U.S. economy.